There needs to be a single version of the truth in your business when it comes to storing locations of customers, depots, facilities, warehouses, and any other real-world locations that you deal with. Some companies call it GIS, but put simply it’s a database that’s hosted in one location that you and other team members can access in your day-to-day business activities. When you have copies of the same data in multiple places, the data begins to change over time and then one day your company arrives to a customer’s old address and makes a costly mistake. 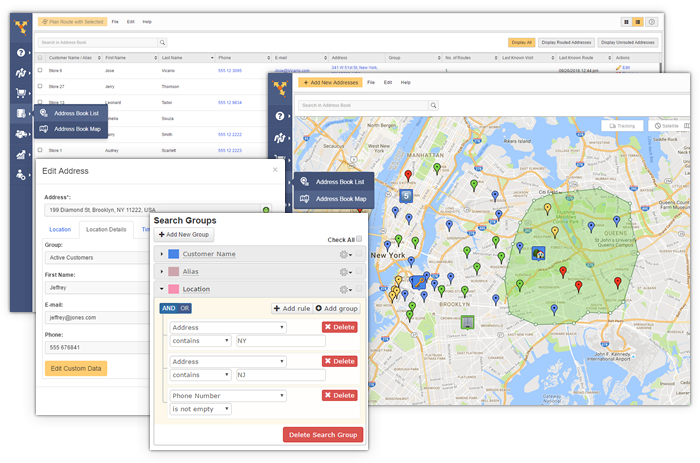 Route4Me’s Address Book and Address Book Map are online tools which permit you to visually see all your customers, locations, territories, and zones on a single visual map. You can then create filters, search by attribute, set delivery schedules, and plan routes directly from the address book. The Address Book works well together with our Territory Management features. You can update the address book through our website and our mobile apps. Since your team is constantly out in the field, they also have the ability to update and make suggestions about a specific location, such as a preferred loading dock entry point, or where to park a vehicle during rush hour.